TwinSpires.com is a US-legal horse racing betting site owned by Churchill Downs. The company was founded in 2010 when Churchill Downs acquired the assets of YouBet.com. Today, Twin Spires is the official online wagering service of the Kentucky Derby and allows for real money betting on hundreds of racetracks around the world. Owned and operated by the legendary Churchill Downs racetrack, TwinSpires.com is an experienced and trusted name in online racing betting. A free account with Twin Spires gives you the ability to bet on thoroughbred, harness and quarter horse races at roughly 300 tracks across the United States, UK, greater Europe, New Zealand, South Africa and more. This makes TwinSpires.com the most comprehensive horse racing site. It’s not often you find any sort of gambling site licensed to do business in the US, but Twin Spires is indeed US-owned and operated. The company headquarters is located in Mountain View, California with part of its operations based out of Oregon. This isn’t your typical offshore betting site licensed by questionable regulators; this is a legitimate business that operates with the full blessings of US lawmakers. All new customers to TwinSpires.com are eligible for a $100 deposit bonus. If you sign up for an account and place a total sum of wagers equal to at least $500 within 30 days, the site will drop an extra $100 into your real money account. This is a little different than most signup bonuses in that it isn’t based on the size of your first deposit. You just have to place enough wagers within your first month to qualify. If you deposit $20 and go on a big run to the point where you’re able to place $500 worth of wagers, you still qualify. 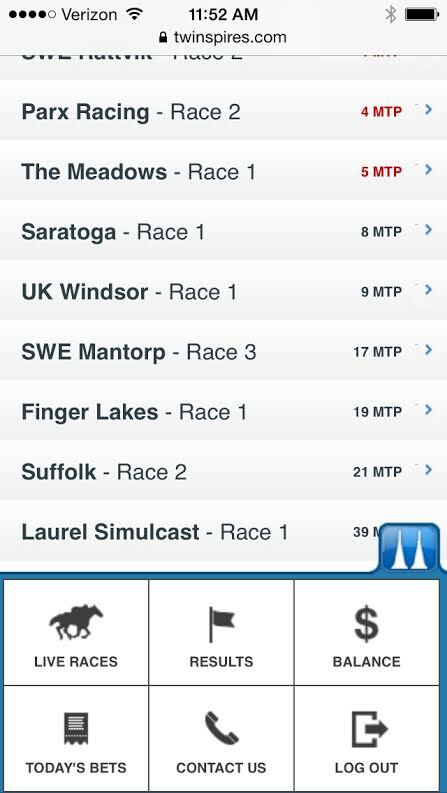 The TwinSpires website accepts the same wagers that are available in-person at the track. All bets placed online are pooled with the wagers placed in-person and your payouts come back from that same pool. The end result is that you get the very same experience online that the people at the track get. You’re not going to miss out on any types of bets or big payouts just because you book your bets over the internet. Additionally, the odds are updated in real time at the website. You get all the same information that those at the track have access to. You can even cancel your wagers before the race if you don’t like the odds or you change your mind. There are a number of options for inputting your bets as well. You can place them at the TwinSpires.com website, over the phone with an agent, online with your mobile device and with their touch-tone automated phone service. You don’t have to be at the PC or track to place your bets. 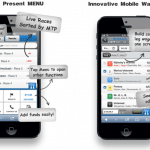 If you have a smartphone or tablet and a connection to the internet, visit m.twinspires.com for the mobile-friendly website. I tried it just now with an iPhone and an iPad and the mobile version works great. It feels like an actual app even though it’s just a website formatted to fit your screen. 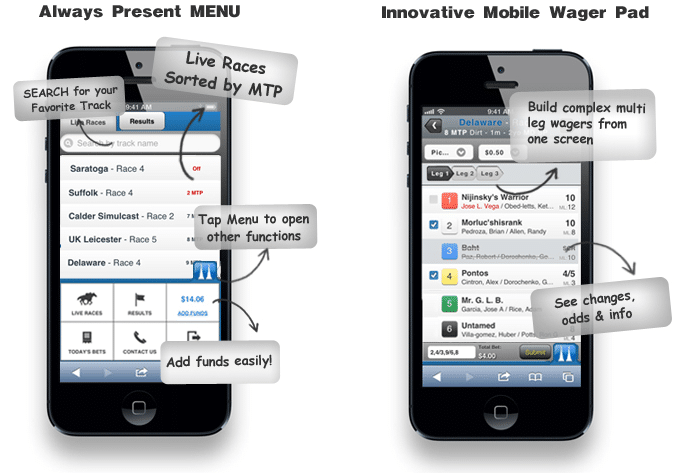 The tracks and wagers are displayed a little differently at the mobile site to make it easier to navigate, choose tracks and structure your bets. I found it easy to use and you probably will too. The mobile site runs quickly and gave me no problems. Conditional wagering is a very handy service that I haven’t seen at any of the other USA friendly racing sites. What it does is lets you set the conditions for a bet on an upcoming race and then the website automatically places the bet on your behalf – but only if the conditions are met. For example, you know that a certain race has a horse and jockey you like. You decide you’d like to place the bet but only if the odds are at X or better. 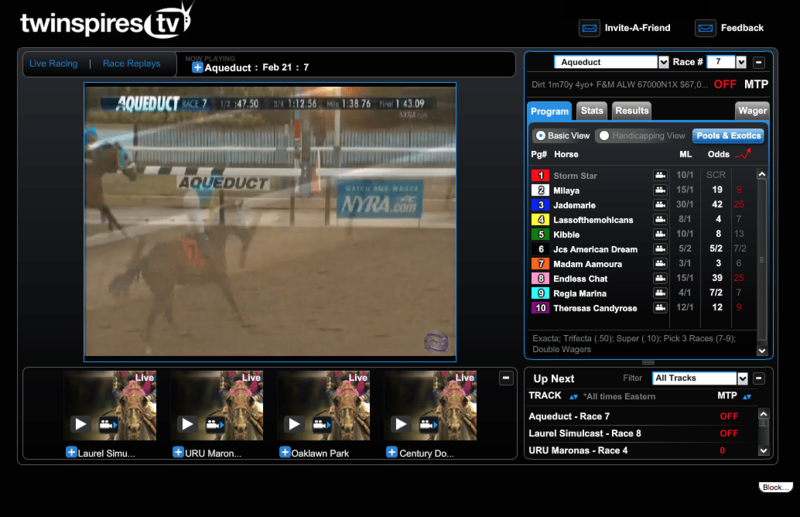 You determine the minimum payout odds and schedule the minutes-to-post time frame. If the bet meets those odds within that period of time, it is placed. If not, the bet is not placed. A comprehensive lineup of betting tools is a major advantage in TwinSpires’ favor. There are three different betting interfaces that you can switch between depending on your needs. 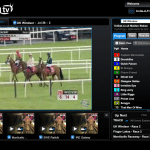 Do you want more information and the ability to view up to 5 tracks at a time? Go with the Classic View. Are you in a time crunch and need to place your bets quickly? Go with the Express View. Additionally, they have a number of handicapping tools that help you make more educated wagers. These include a free subscription to Brisnet’s past performance results, daily horse racing news, the handicapper’s edge newsletter and free software tools that you can use to analyze upcoming races and collect useful data. TwinSpires.com gives you access to quite a bit of data and tools, so it may take a while to get the hang of it all. Even so, I recommend familiarizing yourself with everything they offer in this regard. There is no reason to limit yourself to guesswork when there are so many analysis and handicapping tools that will improve your bottom line. 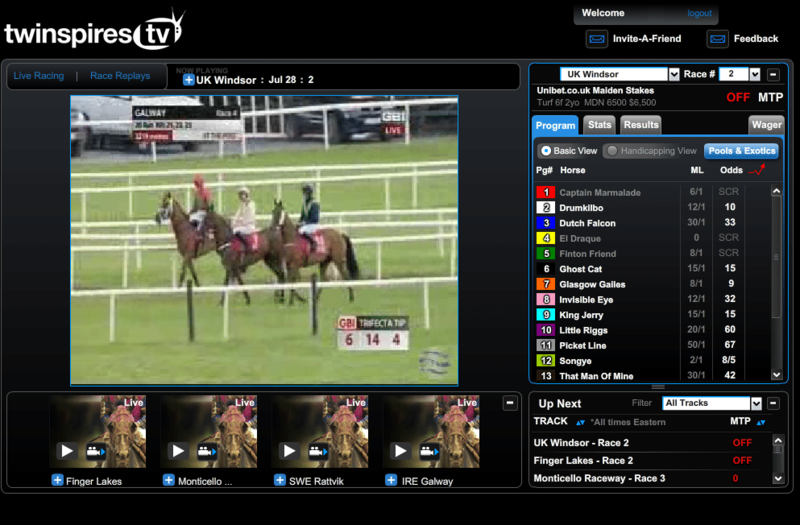 Both live racing video and replays of past events are available free to all members. You don’t need to place a bet or make a deposit. All you need is an account and you can watch up to five tracks at once in real time on your computer. The TSC Elite program rewards all customers for placing bets at TwinSpires. Every dollar that you wager results in 2 TSC points with an additional 2 points per dollar for wagers placed at CDI owned properties (Calder, Fairgrounds, Arlington and Churchill Downs). You can redeem your points for discounted and free handicapping products offered by Brisnet. These include track stat publications, sire stats publications and more. The points that you earn also qualify you for the VIP program which results in free racing programs, cash back rewards, discounted or free access to tracks and VIP access to special functions at major tracks. *Walk-in deposits can be made at Churchill Downs in Kentucky, the TwinSpires.com call center in Lexington, KY and Scioto Downs in Columbus, Ohio. TwinSpires is a well-rounded horse racing sites backed by one of the oldest and most respected names in the industry. Safety and fairness aren’t even at question here. This place is definitely legit. It’s also comforting to know that you’re playing at a site that operates legally on US soil.